Across Western Europe and North America, the middle class is shrinking, according to a new report by the OECD. 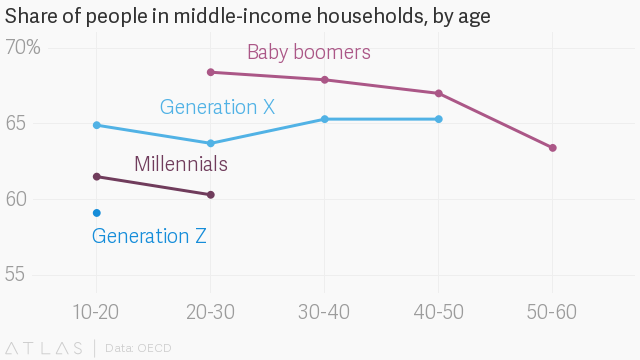 With each new generation, a smaller share of the population find themselves earning middle incomes. When the Baby Boomers, who were born between 1943 and 1964, were in their twenties, some 68% were in middle-income households. Only 60% of Millennials, who were born between 1983 and 2002, could say the same at a similar time in their lives. The OECD defines the middle class as people earning between 75% and 200% of the national median annual income. Its data is an average of results from Canada, Denmark, Finland, France, the United Kingdom, Ireland, Italy, Luxembourg, Mexico, the Netherlands, Norway, Spain, Sweden, and the United States. The “economic influence” of the middle class has also dropped sharply over time, said the OECD report, which was published on April 10. Across the OECD, middle incomes have increased by just 0.3% per year, on average, over the past decade. By comparison, in the decade before the financial crisis, middle incomes grew by 1.6% per year, and by 1% the decade before that. Housing costs are squeezing the middle class the hardest; this now consumes a third of disposable income for middle-class households, up from a quarter in the 1990s. Housing and higher education expenses have been rising faster than middle incomes, the OECD said. The gradual hollowing out of the middle class is a complicated story. For example, in the US, the Pew Research Center found that America’s shrinking middle class is the result of some people slipping into lower income classes, but an even larger share of the population rising into the upper classes. However, these figures disguise intergenerational inequality. Research led by Harvard’s Raj Chetty has shown that social mobility is declining, as fewer children earn more than their parents. Indeed, for each new generation in the OECD’s aggregate average, the middle class is getting smaller, the upper class is stable, and the lower class is expanding. Still, there are differences between countries. The OECD data show that the US middle class has shrunk as a result of both the lower and upper classes expanding, although the latter has grown by almost twice as much. In Spain, the decline of the middle class is entirely due to people falling into the lower class. In the UK, the lower class has gotten smaller, while the upper class has grown, but within the middle class, the lower-middle has grown while the mid-middle and upper-middle are in decline.